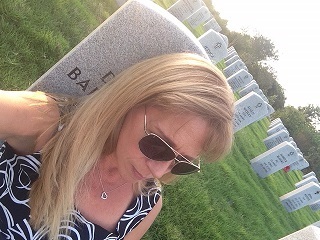 “We’re not going to turn into people who spend all their time at the cemetery, are we?” I asked after my father died. I loved my Daddy, don’t get me wrong. Everyone loved Dave the Wave. But we weren’t cemetery people. Cemetery people spend a lot of time at cemeteries. They visit grave sites often; they decorate for holidays, birthdays, and anniversaries; they make sure flowers are fresh and ever-present. That’s lovely, and there’s not one thing wrong with it, mind you. But that’s not us. We remember my father with tales of his Easter Sunday resurrection re-enactment, or stories about his basset hound. We laugh at the doodles in his high school yearbooks, and gift each other with mementos. I’m a writer, so often I process my journey, share my struggles, or commiserate with folk who know my special shade of loss on the page. But cemeteries? “Skin and bones,” my nephew says. “That’s all that’s here.” I don’t need the cemetery. My father is buried at Houston National Cemetery, a beautiful, sublime place with vast expanses of open sky, shaded pine groves, and lakes and fountains chock-full of herons and assorted wildlife. The graceful orderliness of rows upon rows of perfectly aligned headstones is strangely soothing. The dignified bell tower chimes dutifully, a respectful reminder that time marches on. Because it’s a veteran’s cemetery, Wreaths Across America covers the graves in Christmas greenery during the holidays, and the wreath-laying ceremony has become a poignant but favorite part of my family’s holiday tradition. And then there are the coins. More than once, I’ve arrived at my father’s grave to find what I thought was pocket change. I’ve since discovered that leaving coins on the headstone of a veteran is a time-honored tradition. I started dropping by the cemetery shortly after Daddy died. It was literally on my way to a whole host of places, and stopping in for a few minutes reminded me of the times I’d pop in to his office when I was out and about. A quick, impromptu visit with my Daddy was always a favorite treat. Turns out, death didn’t change that. Plus, the cemetery is a great place for wailing, sobbing and gnashing of teeth; the kind of mourning that can leave friends and family whispering and wondering about whether or not you’re okay. Skin and bones? Sure, but there’s more to it than that. There’s peace and quiet; the good kind that settles your soul. There’s compassion. More than one cemetery person has offered a kind smile, a warm gesture, even a hug when confronted with my unfiltered grief. And plenty have offered their silent understanding and acceptance, including the groundskeepers. God bless them all. We keep my father’s memory alive every day in a million different ways. And he is indeed with all of us. He’s with us when we feast on my brother’s brisket, smoked to perfection per the Wave’s exacting standards. He’s with my mom as she putters around her new house, making a beautiful new home and a brave new life for herself. He’s with his grandchildren, guiding them as they grow into kind, compassionate, caring humans. But the cemetery? Well, creepy as it may sound, I like to think of it as our place. A place where I can remember, reflect, and rejoice in the blessing that was my Daddy. And that, I suspect, is precisely what a cemetery person would say.